We've seen a few rather confusing leaks regarding upcoming Motorola devices recently, but now a new one clears things up thankfully. An earlier report talked a bit about one such handset, and at the time we weren't sure whether it would end up being called Moto E4 or Moto C. It turns out it was the latter. The Moto C will be joined by a slightly more powerful Moto C Plus, according to famed leakster Evan Blass. 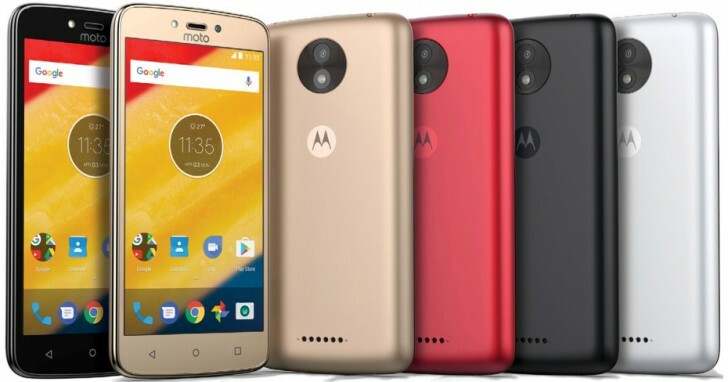 The Moto C will allegedly come with a 5-inch 854x480 touchscreen, a 5 MP rear camera with LED flash, a 2 MP selfie cam with a flash of its own, 1GB of RAM, and a 2,350 mAh battery. The Moto C will have two versions. The 3G model will come with a 32-bit 1.3 GHz quad-core MediaTek processor, 8GB of expandable storage, and a fixed-focus rear camera. The 4G version will have a 64-bit 1.1 GHz quad-core MediaTek processor, 16GB of expandable storage, and an autofocus rear camera. Moving on to the C Plus, this will reportedly arrive with 720p resolution for its 5" display, a 1.3 GHz 64-bit quad-core MediaTek CPU, 1 or 2GB of RAM (depending on region), 4G LTE, 16GB of expandable storage, an 8 MP main camera, and the same 2 MP selfie unit from the C. The C Plus will be kept running by a big 4,000 mAh battery. Both the C and the C Plus will be offered in a bunch of colors, including black, white, gold, and red (all of which you can see in the leaked renders above). As of now there's no information about a possible release date for the new C line, but given how much about it has been leaked already we assume the official introduction can't be far off at this point. 854x480 pixel screen at 5inches,imagine how data-saving it is ! 1GB/2GB RAM in 2017? These phones will become useless in a few months. And bad cameras too. I know these are budget phones, but buying these are like throwing away money. Why on earth we get a shove with 3000mAh on flagships with 5.5" screens while entry phones get 4000mAh WHY? !